For general workshop the most commonly used is the column and knee type. These machines have a single spindle only. 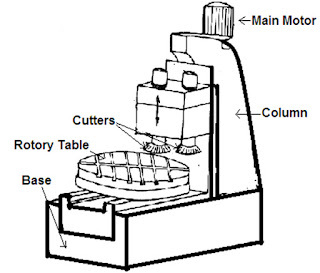 They derive their name “Column and Knee” type from the fact that the work table is supported on a knee like casting which can slide in a vertical direction along a vertical column. The up and down movement of the table can accommodate work of various heights. Main parts of column and knee milling machine are as follows. (a) Base - The base of machine is a grey cast iron casting provided at the bottom of the machines. It is accurately matching on both top and bottom of the machine surface. Column of the machine is secured to its base and serves as a reservoir for the coolant. 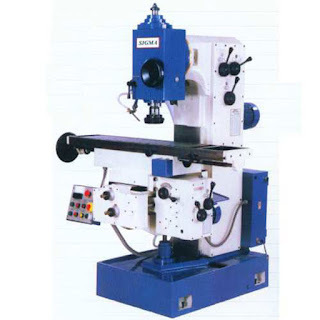 (b) Column - It is a very prominent part of milling machine. The column is box shaped heavily ribbed in side and houses all the driving mechanism for the spindle and table feed. The front vertical face of the column is accurately machined and is provided with dovetail guide ways for supporting the knees. Top of the column carries dovetail in horizontal ways for the over arm. (c) Knee - It is the rigid casting which is capable of sliding up and down along the vertical ways on the front face of the column. The adjustment of the height is affected by elevating screw mounted on the base that also supports the knee. The knee houses the feed mechanism of the table and different controls to operate it. The machine horizontal ways are provided on the top surface of the knee for the cross traverse of the saddle and hence the table. For efficient operation of the machine, rigidity of the knee and accuracy of its ways play an important role. On the front face of the knee two bolts are usually provided for securing the braces to it ensure greater rigidity under heavy loads. These machines are of the column and knee type and consist of a rigid frame or box structure. It consists of a table, a saddle and a knee. This gives three straight-line movements perpendicular to each other. The arbor is fixed in position, and the tool rotates while the work is fed past the cutter in a straight line. It is a useful machine for manufacturing operation involving simple, straight line cut. 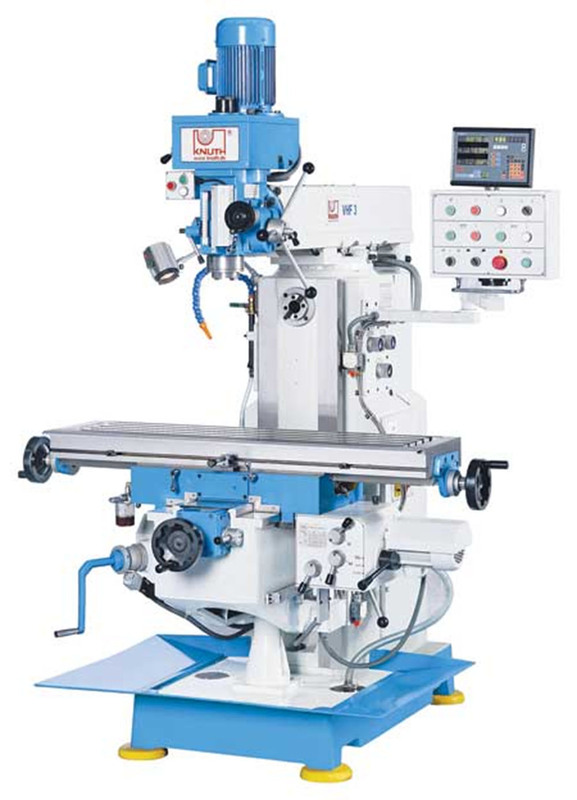 A universal milling machine is so named because it may be adapted to a very wide range of milling operation. 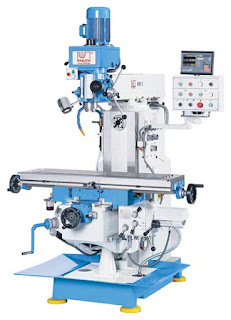 A universal milling machine can be distinguished from a plain milling machine that the table of a universal milling is mounted on a circular swivelling base which has degree graduations and the table can be swivelled to any angle up to 450 on either side of the normal position. This is advantageous when milling spirals. 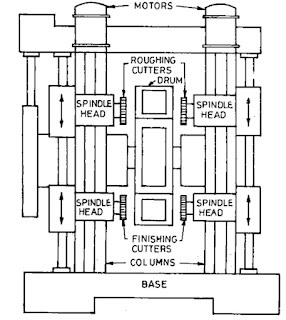 Thus in a universal milling machine in addition to three movement as incorporated in a plain milling machine, the table may have a fourth movement when it is fed at an angle to the milling cutter. 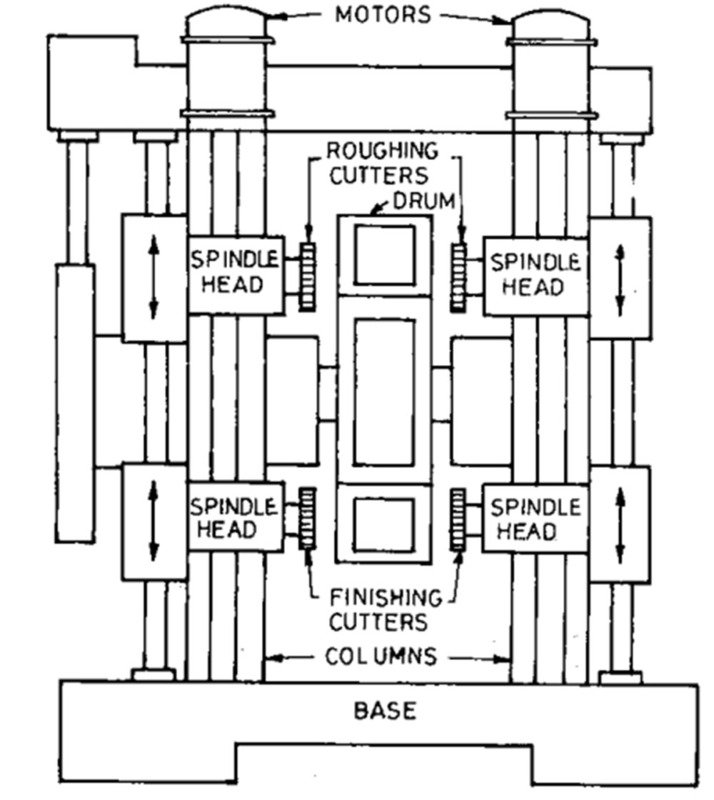 In this machine, the table having all the movements of a universal milling machine, and can be tilted in a vertical plane by providing a swing arrangement at the knee. The entire knee assembly is mounted in such a way that it may be fed in longitudinal direction horizontally. 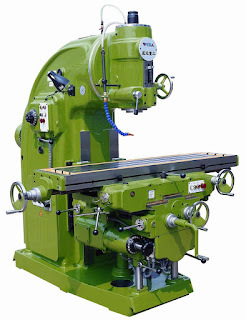 The additional swivelling arrangement of the table enables it to machine taper spiral grooved in reamers, bevel gears etc it is essentially a tool room and experimental shop machine. There are two types of vertical spindle milling machines. (a) Fixed bed type (b) Column and knee type. A vertical milling machine can be distinguished from a horizontal milling machine by the position of its spindle, which is vertical or perpendicular to the work table. The machine may be a plain or universal type and has all the movements of the table for proper setting and feeding the work. The spindle head which is clamped to the vertical column may be swivelled at an angle, permitting the milling cutter mounted on the spindle to work on angular surfaces. In some machine the spindle can be adjusted up or down relative to the work. (a) Horizontal Simplex Milling Machine - These types of machines are production type machines and are of rigid structure which yields high production of interchangeable jobs. It has got one spindle head. 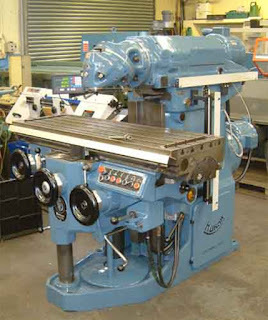 (b) Horizontal Duplex Milling Machine - Milling machines using the two spindles. for finishing two surfaces of casting at a time. (c) Triplex Milling Machine - Milling machines using the three spindles, two horizontal and one vertical for finishing three surfaces of casting at a time. They are used for heavy work. Upto a maximum of four tool heads can be mounted over it, which can be adjusted vertically and traverse directions. It has a robust and constructions like a planer. (a) Continuous Feed Rotary Milling Machine - The construction of the machine is a modification of a vertical milling machine and adapted for machining flat surfaces at production rate. The face milling cutters are mounted on two or more vertical spindles and a number of work pieces are clamped on the horizontal surface of a circular table which rotates about vertical axis. The cutters may be set at different heights relative to the work so that when one of the cutters is roughing the pieces the other is finishing them. 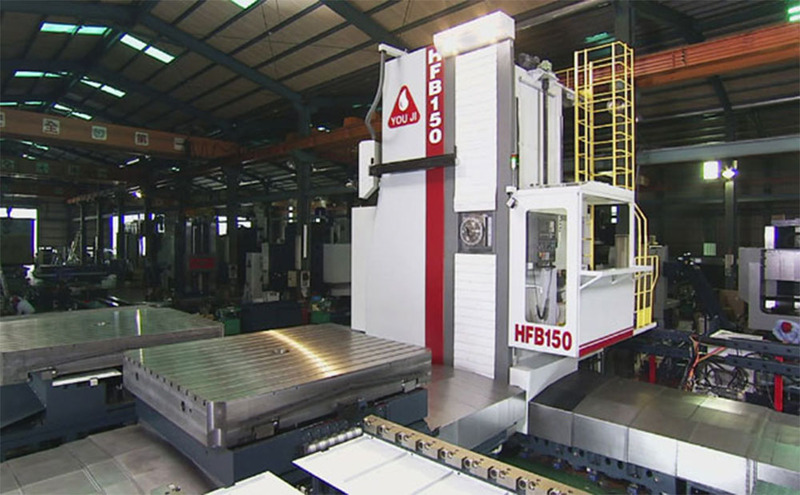 Operator may carry out a continuous loading and unloading of the work pieces, while the milling is in progress. 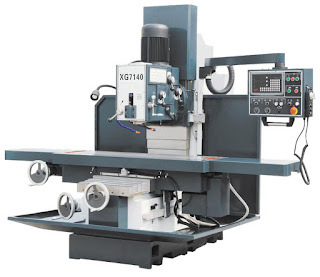 (b) Drum Type Milling Machine - The drum type milling machine is similar to rotary table milling machine in that its work supporting table which is called a drum, rotates in a horizontal axis. 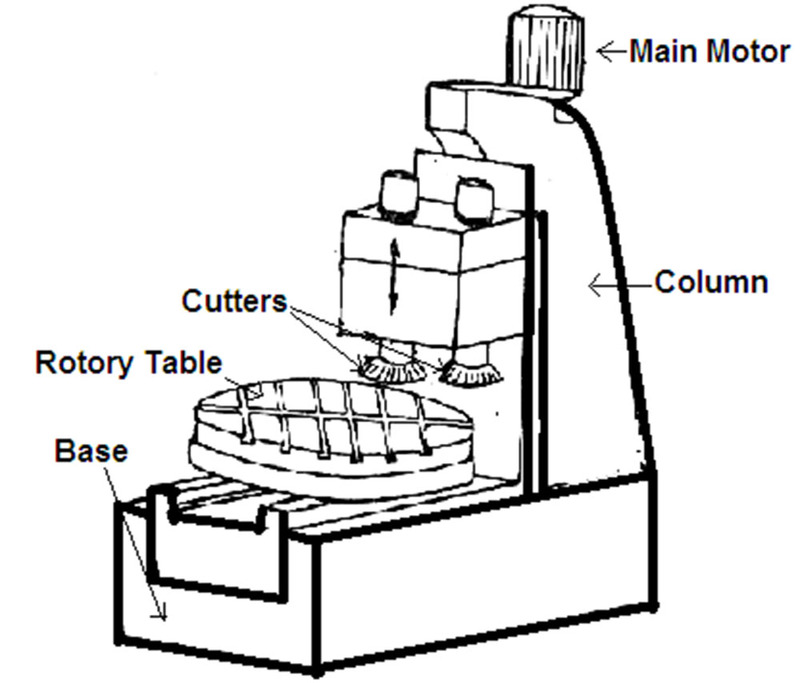 The cutters are face mills and are usually roughing and finishing cutters similar to those of a rotary table miller. Fixture is mounted to the drum either on each face or on the periphery. When the work is mounted on the periphery, the operation is usually facing the two ends of the work piece to the precise length. The finished machined parts are removed after one complete turn of the drum and then new ones are mounted on it.